At Comfort TV, David talks about a different kind of reality television: the times when real world events intrude on weekly series. Hint: remember the time when Lucy broke her leg? You never really need an excuse to watch Phil Silvers play Bilko, but Hal at The Horn Section has a good one anyway, contributing to the 2nd Favourite TV Episode Blogathon with the "Hollywood" episode of The Phil Silvers Show. For more episodes on that blogathon, check out all the contributions at A Shroud of Thoughts. One of the many great things about Carol Ford's fine Bob Crane biography is that she reminds us of Bob's career in radio prior to Hogan's Heroes. This week, Carol looks at some articles from his early radio show, and gives us a glimpse at a star in the making. I'll have a review of this book shortly, but I'll tell you now that I can't recommend it highly enough! Comedy writer Ken Levine has another of his "Friday Questions" feature, and it's worth investing some time. As usual, some very good questions from readers, and some fascinating answers from Ken. At The Lucky Strike Papers, Andrew gives us a heads-up on Martin Grams Jr.'s upcoming books - one on Truth or Consequences (the TV show, not the city in New Mexico), and the other on The Big Show, Tallulah Bankhead's early '50s NBC radio show. He's hoping to have them out by this year's Mid-Atlantic Nostalgia Convention this September. I'd like to be able to go to that some year, but if I didn't make it when we lived in North Carolina (it's held in Maryland), what chance to I have to rouse myself to go when I live in Texas? Speaking of Martin, his own blog has a very good article on the origins of This is Your Life. I'm sorry, but every time I see that show, I think of the hilarious parody Sid Caesar did on Your Show of Shows - still funny every time I see it. Recap Retro reminds me of a show I used to watch in the early '70s - Ghost Story, aka Circle of Fear. It wasn't a bad show, wasn't a great one, but was enjoyable enough. This recap is of the episode "Alter-Ego." I don't want to do all your work for you, so be sure to check the blogs on the sidebar for more good stuff, and come back here tomorrow for another TV Guide, OK? 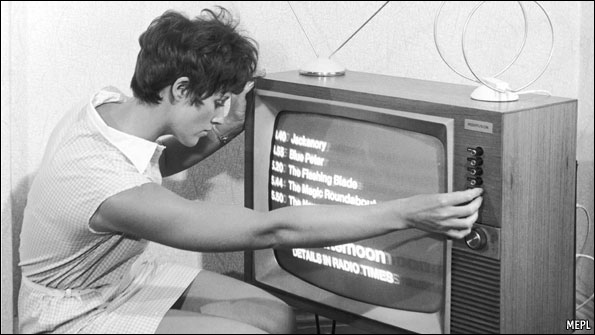 Early television: good or bad?